Gv650c Aquila stillnot charging replaced RR, battery healthy, stator good reads. 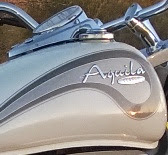 Re: Gv650c Aquila stillnot charging replaced RR, battery healthy, stator good reads. As long as the voltage doesn't go DOWN when you rev it, then it's fine. Sure that is fine in idle but I should be over 14v at 5000rpm as per manual? Regardless I still ran all the way down to 11.4v after two days or riding . Correct me if I am wrong but when you increase revs do you use more power hence why there should be more volts or? That would explain why I ran out of battery in the first place. If your charging at anything over 13.5 volts and your battery is losing charge , your battery is fooked or your bike is draining the battery when it's switched off , which it shouldn't. You need to get someone to Check it that has some idea how electrical systems work . I don't suppose you know what a clamp meter is or how to use one ? Okay all I was asking is for some help not to be treated like an idiot. I'll find my help somewhere else then. I never referred to as an idiot . You just seem to struggle with the basic systems . What do you call a Greek falling out of an aeroplane? I believe he never followed the sage advice given weeks ago about running a duplicate wire from the RR to the battery positive terminal and making a new earth lead as well? We've all had to do it. Would have fixed all his problems on day 1. You are right in that his Reg wasn't even connected to the battery it turns out and if he had run another cable , he may have saw it was disconnected a lot earlier . I think I used extra 16mm cables on my system which was a bit large but better too big than too small and it's not as if you can see them . I would have used welding cable if that is all I had mind .